I love pesto. I mean, how could you not, right? Basil, pine nuts, garlic, Parmesan…the flavors are totally swoon-worthy. Luckily, my fiancé also loves pesto (I would reiterate that duh, it’s almost impossible not to like it, but he doesn’t like bacon. Or French fries. Or peanut butter. So…yeah. His taste in fiancees makes up for it), so I was looking for a fun new way to serve it. 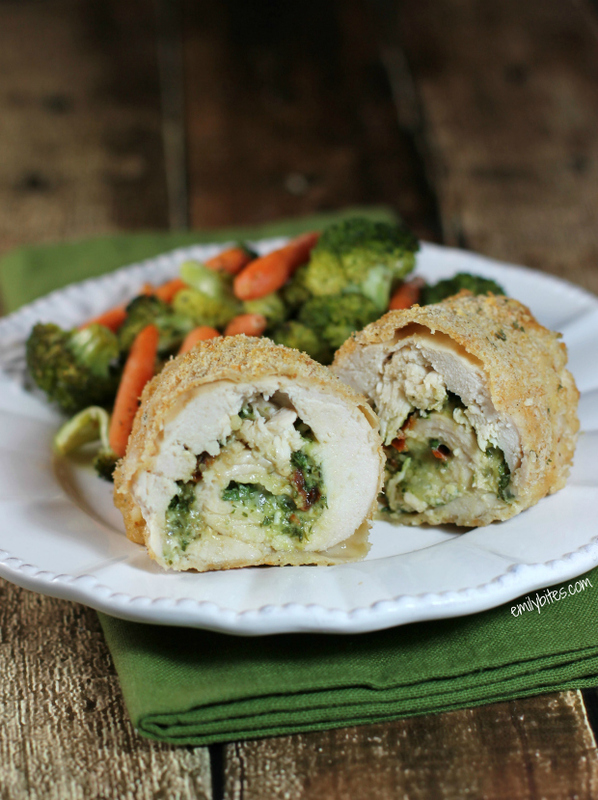 Pesto and chicken are a match meant to be, so I thought rolling all that delicious flavor up inside some breasts would be a fun surprise. 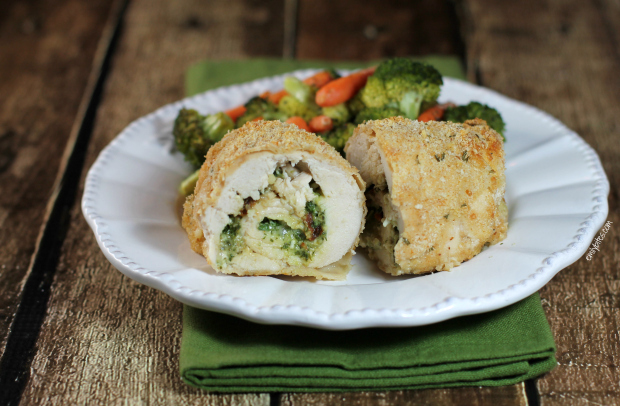 I tossed in some Mozzarella (more cheese is always good) and sun dried tomatoes and added some tasty Parmesan- bread crumb coating to round out these tasty Pesto Chicken Roulades. He loved it! I did too, of course. If you’re hooked on pesto like we are, you may also want to try out my Chicken Pesto Wonton Cupcakes, Pesto Pasta with Asparagus, Sun Dried Tomatoes and Arugula, or my Grilled Chicken Pesto Wraps. You may also want to plant some basil while you’re at it…you’ll want more! Bring a small, dry skillet over medium heat and add the pine nuts. Cook for 1-2 minutes, stirring occasionally until nuts are golden brown. Transfer the toasted pine nuts, fresh basil leaves, 4 teaspoons of the Parmesan cheese, oil, water, lemon juice, garlic clove, nutmeg, salt and pepper to the bowl of your food processor and process until minced together into a pesto paste. Place the chicken breasts on a cutting board. Using a meat mallet, pound the breasts to a ¼ inch thickness. Spread the pesto evenly across the surface of each breast. Sprinkle the sundried tomatoes and shredded cheese over the pesto. Starting with a short side, roll each breast up and seal the edges shut using a few toothpicks. Place the rolled and sealed breasts in a Ziploc bag and add the flour (you may want to split this into two batches). Lightly flip the bag around until chicken is coated. Place the beaten egg white in a shallow dish. In a second shallow dish, mix the bread crumbs and Parmesan cheese. Remove each rolled breast from the flour bag and dip it in the egg white, turning to coat. Then move the coated breast to the breadcrumb dish and coat it with crumbs on all sides. Place the completed rolls seam side down on the prepared baking sheet. I just made these for dinner. They came out delicious! What a great recipe! Thanks! Made this last night. BF and I LOVED this recipe! We’ll be making this again. Made these and they were awesome! Side note about the toothpicks–don’t use colored toothpicks. They’ll bleed and make the chicken look bad. Still taste awesome though, just don’t look as nice. Sure! I don’t really ever freeze recipes, so I haven’t done it personally, but I think I’d freeze them before baking. Can you use premade pesto for this? Sure! It will just change the nutrition info/points if you care about that. Enjoy!